ALEXANDRIA, VA (June 14, 2018) — Soon, Pete DeTemple will board a plane to Colorado for a trip to the U.S. Senior Open Championship, which he qualified for last month in New Jersey. He’ll take with him a measure of confidence after claiming his first individual Virginia State Golf Association championship. DeTemple, a member at Old Hickory Golf Club, took a two-stroke lead at the turn in Thursday’s second round of the 33rd VSGA Senior Stroke Play Championship and held on for dear life. His two-putt par on No. 18 held up when Jim Woodson’s 10-foot birdie putt slid left of the hole, giving DeTemple a one-stroke victory. 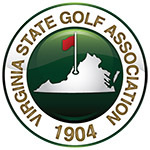 DeTemple posted a 1-over 69 at Mount Vernon Country Club Thursday for a two-day aggregate 3-under 133, leaving him a shot clear of Woodson (Mill Quarter Plantation) and Buck Brittain (The Virginian GC). DeTemple, who won the 2016 VSGA Senior Four-Ball title with Mike Krulich and lost to Krulich in a playoff a month later at the Senior Stroke Play, swung it well Thursday, too, but like the two players who finished a stroke back, he struggled to convert on the greens. That led to some tense moments down the stretch. DeTemple’s two-shot lead at the turn evaporated immediately when he made bogey on the short par-4 10th and Woodson made birdie, leaving the two tied atop the leaderboard. Woodson bogeyed No. 12 and DeTemple hit a tree on his over-water approach on 14, leading to a bogey that left the competitors level again. Woodson misjudged his shot on the par-3 15th hole, leaving him above the hole for his birdie putt. He ended up making bogey, and DeTemple had the lead for good. But closing out the victory didn’t come easy. On the par-3 16th hole, DeTemple’s tee shot was a line drive that settled in thick rough short and to the right of the hole. He got up-and-down for par, and Woodson and Brittain both just barely missed their birdie attempts. After all three made par on 17, DeTemple went to 18 clinging to his one-shot lead. His approach was on line but scooted well past the hole, leaving him a tricky 30-foot comebacker. Woodson put his approach 10 feet right of the flagstick, giving him an excellent look at birdie. Brittain’s approach was right on line but came up short of the green, leaving him stunned in the fairway. DeTemple’s putt came up a foot short of the hole, leaving him an easy tap-in for par. He then had to sweat out Woodson’s birdie attempt, which had it fallen, would have forced a playoff. Leon Roday (Kinloch GC) shot a 1-under 67 for a two-day 135 to finish in fourth. George Kapetanakis (Trump National GC) followed his opening-round 66 with a 70 to finish alone in fifth at 136. DeTemple will be making his second U.S. Senior Open appearance, having shot 76-75—151 to miss the cut in 2012 at Indianwood G&CC in Michigan. He’s thrilled for the opportunity to add more to his 2018 resume, which includes titles in the Senior Stroke Play, the Fox Puss senior division and the Society of Seniors Masters. 36-hole stroke play competition (18 holes per day). Age groups will be 50-54, 55-59 and 60-and-over. All players will compete from the same set of tees. Open to VSGA members at least 50 years of age holding an active GHIN number issued by a licensed VSGA Member Club in good standing.